Good morning my crafty friends I hope you are all well on this dull morning. I have used Lilli of theValley.All flowers are handmade.The image Coloured with promarkers. The image on this card reminds me of my grandparents Jack and Alice.A little story. My grandad had a scooter in the 60,s one day my nan was on the back and a policeman pulled them you wern,t supposed to have some one one the back in those days.any way police says what's your name sir and grandad said jack policeman says no such name as jack you must be John, gramps said who went up the hill with Jill then. My grandad was christened jack. They both got a big fine and there was even a write up in the local news paper.so from this story I named the card Jack and Alice. Hope you like it . That's beautiful lyn. love the colours and love the story. lol. This is fabulous, I love the papers and your flowers are brilliant. This is a great card Lyn and I love the story behind it!! I'll tell you a little story of my own in a similar vein next time I see you. Hi Lyn. Fab image and pretty card. Thanks for joining us at I ♥ Promarkers this week and good luck. How cute is this, the LOTV image is adorable and the layout is fab. This is so sweet, I love the beautiful shade of pink and the adorable image which you have colored beautifully. Awwww, what a lovely story and such a cute card! Love it!! 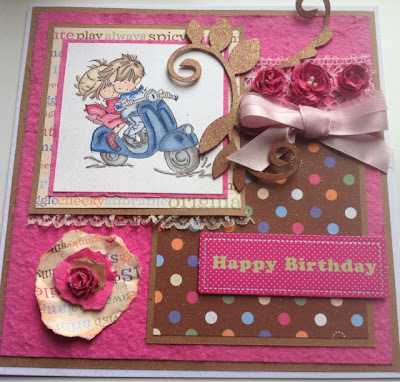 This is gorgeous Lyn, love the colours and everything on your card... no wonder this image reminds you of your dad :D .. Thank you for joining us at I ♥ Promarkers this week and good luck.